The beautiful story of little Mohamad started at the French Medical Institute for Mothers and Children (FMIC). Mohamad’s parents have longed hoped to have a child, until their wish finally came true after medically assisted procreation in India. Mohamad was so eager to discover the world that he was born last August 26 at FMIC maternity ward at only 26 weeks. Not only premature, Mohamad also suffered from a congenital heart defect called “patent ductus arteriosus”. The treatment of patent ductus arteriosus consists in closing the ductus arteriosus either by using anti-inflammatory drugs or closed heart surgery. For Mohamad, the drug solution proved ineffective and the decision was made to carry out a surgery as soon as possible in order not to increase the risk of pulmonary artery hypertension. 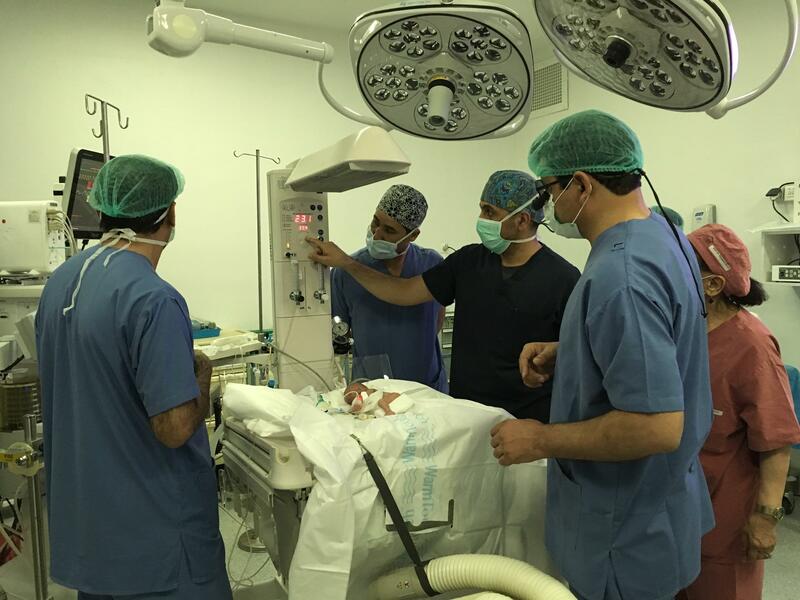 On 25 September 2017 at 3:10 pm, little Mohamad, weighing just 890 g, was operated on for patent ductus arteriosus by Kabul FMIC heart surgery team. Prior to the surgery, several extubation attempts showed that Mohamad could not breathe without being intubated. Within five days, Mohamad will be extubated and able to breathe normally thanks to the ligation of the ductus arteriosus. The operation, carried out by Dr Najeebullah Bina, heart surgeon on mission for La Chaîne de l’Espoir, and his team made of Afghan doctors and nurses, was truly successful. This surgical feat is a first in Afghanistan, where health structures still remain basic. The French Medical Institute for Mothers and Children is today the only hospital in the country in a capacity to perform such a surgery, mainly because its neonatology unit and qualified staff can care for preterm babies in the best conditions. Our congratulations go to all the medical team at FMIC for this wonderful accomplishment and our best wishes for health and happiness to little Mohamad and his parents.